The patient’s past medical history included allogeneic renal transplantation 3 years prior, secondary to progressive hypertensive kidney disease. His current immunosuppression regimen was mycophenolate mofetil, cyclosporine, everolimus and steroids, while his hypertension was being controlled with nebivolol. The only other drug taken on a regular basis was oral iron supplementation to manage mild hypochromic anaemia. His symptoms had failed to resolve with a proton pump inhibitor (PPI) trial administered by a gastroenterologist in private practice. He had also undergone noninvasive testing (urea breath test) for the presence of Helicobacter pyloriinfection, with the result being negative. He denied weight loss, vomiting, changes in bowel habit, fever or any other accompanying symptoms in the same time period as his main complaints. No significant information was elicited from his family or regarding his social history (including travels and sexual behaviour). Physical examination findings were unremarkable. The patient had recently undergone blood tests that revealed no significant changes from his previous baseline values. In view of the above symptoms and history an upper gastrointestinal endoscopy was scheduled and performed. The endoscopic findings included erythema with small erosions of the gastric mucosa. Multiple biopsy samples were obtained from areas with findings and also from macroscopically normal mucosa. Histological findings are shown in figure 1. Figure 1 | Histological findings in the stomach of the case patient. Haematoxylin and eosin (H&E) staining. Magnification x400. WHAT IS THE HISTOLOGICAL DIAGNOSIS? IN VIEW OF THE PAST HISTORY OF THIS PATIENT, WHAT WAS THE UNDERLYING CAUSE OF THE SYMPTOMS OBSERVED? HOW SHOULD WE PROCEED REGARDING THE MANAGEMENT OF THIS PATIENT? 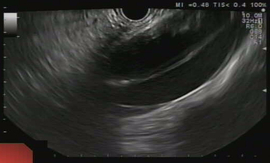 Patients with GG may exhibit epigastric pain, as in this case, but they may have no symptoms whatsoever. There have also been reports of patients with vomiting and weight loss due to gastric outlet obstruction. Bleeding as a manifestation of GG is exceedingly rare, but it has been seen, especially in patients for whom sarcoidosis is the underlying cause, and it may be massive and life threatening.3 There is also considerable variation in the endoscopic findings, which range from a macroscopically normal mucosa to the appearance of erythema, erosions and gastric rugae hypertrophy. In severe cases, there may be ulcers present or obstruction of the lumen due to mass effect similar to gastric malignancy. Figure 2 | Histological findings in the stomach of the case patient. a | Figure 1 revisited. Staining of Iron crystalline material within macrophages of the lamina propria of the gastric mucosa (arrows). b | Staining of iron crystalline material within macrophages (arrows) and giant cells (arrow head). Haematoxylin and eosin (H&E) staining. Magnification x400. In developed countries, the most frequent causes of GG are noninfectious, with Crohn’s disease and sarcoidosis being the most important. Crohn’s disease is the most commonly encountered underlying condition in patients with GG. Clinically detectable gastritis is found in only 3–6% of patients with Crohn’s disease, but microscopic involvement has been described in up to two thirds of all patients with Crohn’s disease. One third of patients who have microscopic findings may have granulomas. It should also be noted that GG may be encountered as a new finding in patients with known Crohn’s disease, but it can also be the first manifestation of Crohn’s disease especially in children.6,7 Sarcoidosis is another systemic condition that can affect the gastrointestinal tract, with a special preference for the stomach. Microscopic involvement may be seen in 5–10% of patients with sarcoidosis, while only 1% will progress to overt symptoms. Endoscopic findings tend to be more impressive in cases of GG caused by sarcoidosis than in those with other underlying causes, they can range from ulcers to polypoid-like lesions that may cause bleeding or obstruction, respectively.8 Rarer noninfectious causes include vasculitides (e.g. granulomatosis with polyangiitis), tumours (e.g. MALT or adenocarcinoma, especially with a distal oesophageal location) or drugs (e.g. cocaine or interferon) and chronic granulomatous disease in childhood. A distinct noninfectious aetiological subcategory is GG secondary to foreign body reaction. This is seen as a gastric response to the presence of various substances, such as sutures from previous operations or endogenous materials (e.g. mucin or lipids). A case series has been published that described GG associated with the use of cyanoacrylate glue injections.9 In addition, of particular interest are reports concerning GG presenting after a foreign body reaction to crystalline drugs or agents (e.g. antacids containing aluminium and magnesium). In our case, the histological specimen was highly suggestive for the presence of crystalline material within the macrophages and giant cells. This finding coupled with the patient’s history of taking an iron supplement led to further investigation of the biopsy samples. Staining with Perls’ histochemical stain, more commonly known as Prussian blue, revealed iron crystalline material as the probable cause of the patient’s GG (figure 3). Figure 3 | Iron crystalline material stained blue. Perls’ histochemical stain (also known as Prussian blue). Magnification x400. For our patient, there was a convincing case for GG being caused by iron supplements, but his immunocompromised status warranted further investigation, especially for possible infectious causes. In general, taking a detailed clinical history is essential, as is meticulous histopathological examination with the use of specific stains and/or polarization. Further investigations should then be considered based on the data obtained and pursued according to the degree of clinical suspicion (e.g. ileocolonoscopy for Crohn’s disease, a chest radiograph for tuberculosis or sarcoidosis, measurement of angiotensin-converting enzyme concentrations for sarcoidosis and serum antineutrophil cytoplasmic antibody titres for polyangiitis). Treatment should be tailored according to the underlying aetiology—in case of a foreign body reaction, removal of the culprit substance is beneficial. Repeat endoscopy is useful for assessing accurately the extent of the condition and at a later time the progression or abatement of granuloma presence. Ectors NL, et al. Granulomatous gastritis: a morphological and diagnostic approach. 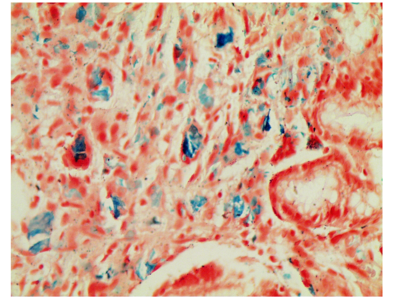 Histopathology 1993; 23: 55–61. Lauwers GY. Gastritis: beyond Helicobacter pylori. Int J Surg Pathol 2010; 18: 28S–32S. Akinyemi E, et al. Gastric sarcoidosis. J Natl Med Assoc 2006; 98: 948–949. Kamani L, et al. Granulomatous gastritis: a diagnostic dilemma? Singapore Med J 2008; 49: e222–e224. Kim YS, et al. A case of H. pylori-associated granulomatous gastritis with hypertrophic gastropathy. Gut Liver 2009; 3: 137–140. Laube R, et al. Oral and upper gastrointestinal Crohn's disease.J Gastroenterol Hepatol 2018; 33: 355–364. Renault M, et al. Age-related differences in granulomatous gastritis: a retrospective, clinicopathological analysis. J Clin Pathol 2010; 63: 347–350. Afshar K, et al. Gastric sarcoidosis and review of the literature.J Natl Med Assoc 2010; 102: 419–422. Guner G, et al. 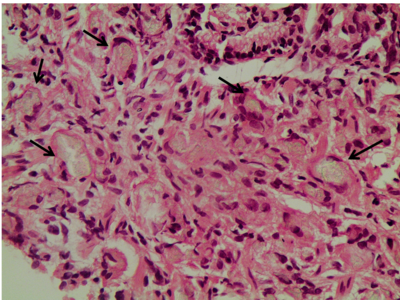 Cyanoacrylate associated foreign body granulomatous gastritis: A report of three cases. Case Rep Pathol 2017; 2017: 2753487. Spyros Siakavellas is a Gastroenterology Fellow in the Academic Department of Gastroenterology, Medical School of National and Kapodistrian University of Athens, General Hospital of Athens “Laiko”, Athens, Greece. In 2018 he joined the UEG E-learning team as a Web Editor. He was trained in medicine and completed his PhD thesis on “The role of the TL1A/DcR3 axis in IBD” at the Medical School of Athens University. He has trained in internal medicine and gastroenterology in the UK and in Greece. His research interests include inflammatory bowel diseases and hepatology. Follow Spyros on Twitter @SSiakavellas. Stratigoula Sakellariou is an Assistant Professor of Pathology at the National and Kapodistrian University of Athens, with a special interest in the liver pancreas, GI and molecular pathology. She was born in Athens, studied medicine at the National and Kapodistrian University of Athens Medical School (1996–2002), completed her histopathology residency in G. Gennimatas General Hospital (2003-2008) and was a visiting pathologist at the Institute of Liver Studies, King's College Hospital, London, UK (2009).